In the early 1970’s the first paper cutting water jet system was used for paper manufacturing at Alton Boxboard in Alton, Illinois, USA. Pure water jets were also used to cut paper-based materials and honeycomb for the aerospace industry. Waterjet cutting is very versatile and doesn’t discriminate in what is being cut! Paper thin materials, paper tissues, boxes, protective poly coating paper, corrugated cardboard, foam, paper sheets, food service paper, industrial packing paper, excelsior cushioning, bags, Tyvek, waxed paper, as well as food, and rubber can be cut just as swiftly as thin carpet. Because the diamond orifice is used to maximize cutting life, typically the size of the stream is a width of a human hair at speeds up to 2.5 Mach. There is no water absorption during the slitting of paper products when water jets are used. Ideal for stacking materials depending on density of product. 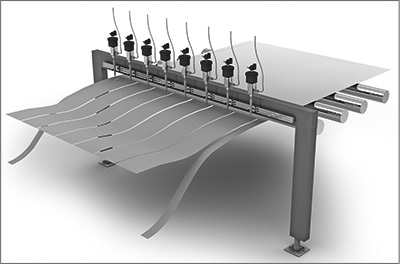 Cutting nozzles can be stationary allowing paper materials fed through conveyor.